Back in the mid-80’s, Mel Galley (Trapeze/Whitesnake) was looking for a new outlet for his musical energies after having left Whitesnake; his producer brother Tom had ideas about a progressive rock concept project, and together they assembled a multi-media piece with contributions from a number of well-known rock musicians, including members of the Deep Purple family such as Glenn Hughes, Don Airey, Cozy Powell, and Neil Murray. Now the recordings have been reissued (andremastered by Mike Pietrini in 2018) with new liner notes, an interview with Tom Galley, and previously unseen artwork and imagery selected by Tom from his personal archive. Since the concept running through the Phenomenon project was one continuous story thread, they have chosen to collect all the additional tracks from the sessions together; they will be released on a forthcoming Anthology CD. Posted by lonewolf on Saturday, February 2nd, 2019, filed under News. You can follow comment on this post through the RSS 2.0 feed. You can skip to the end and leave a comment. Pinging is currently not allowed. The first album is a classic…..the secound is good, and have not heard the third one. 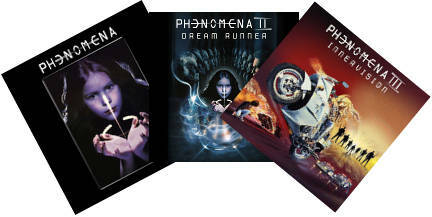 Phenomenon is scary good story to it with arguably Glenn’s finest vocals ever. Hoping the anthology cd will offer something new for fans of this project. Cozy’s demo’s sound impressive as do the with Mel singing ‘Hell On Wings’ and ‘Phoenix Rising’.Iam especially hoping that the Cozy insrumental mix of ‘Kiss Of Fire’ could have Glenn’s lead vocals affixed to them.The guiutars are more promonen and it doesn’t have that period wash of reverb on everything either. Ditto ‘Still The Night’ which I think is Ted McKenna playing drums and the guitars need to come up in the mix!